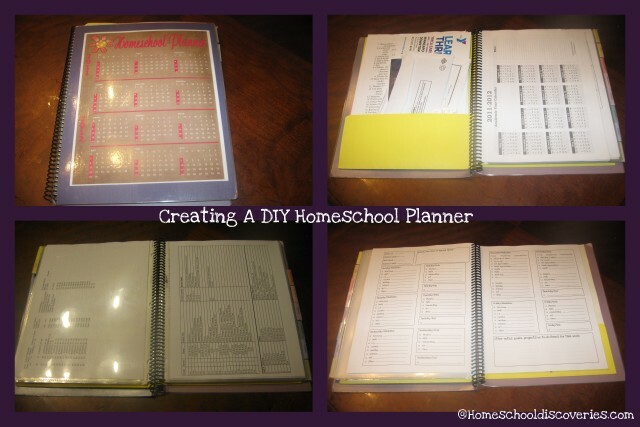 Last year was my first year using a full-blown planner to organize my homeschooling. I just needed a couple of charts and an appointment calendar in past years! I wanted my planner to be a go-to source of information for school plans and for our other activities. I also thought I would use some custom “weekly planner” printables I made to either plan out each subject or jot down what we did after the fact. After I printed all these pages, I took them all to the copy center to be spiral bound together. I also had the cover laminated since it was too large to fit in my home laminator. This year my planner will still contain a monthly calendar for noting family events, a section for meeting schedules and other important handouts, and excel spreadsheets I create to track what I hope we will do when with certain subjects like science and history. I also will included photo-copied tables of contents for all our subjects that are “do the next thing” sort of lessons. I don’t really need to plan out in advance when we will do which math lesson — we always just do the next thing. But sometimes it is helpful to know what topics are coming up. I like having information like that at my fingertips even if we aren’t at home. I’ll save myself a trip to the copy shop by using regular size cardstock for the cover, and using my pro-click binding machine to bind it. That has the added benefit of being able to re-arrange the pages if needed during the year. I put many of my pages in page protectors last year so I could swap them out if needed (yes, the page protectors worked in the spiral binding just fine!). This year it will all just go in the pro-click spine, and I’ll open it up if I need to swap anything out. New Beginnings — Lots of Great instructions and printables. One of the most helpful sites I found! Donna Young — Tons, and tons of free planning pages and charts and calendars. Most are pretty basic in terms of style/appearance, but almost every conceivable column combination is available on her site. 2012-2013 School Year Calendar — I am using this printable to plan my history units for next year…filling in little squares in various colors for each unit is fun! A big round-up of lots and lots of links to free homeschool planners @ Are We There Yet? I have the Homeschool Tracker and use that for most of my planning, along with my hand-scribbled notes and a calendar. That’s worked for many years, but this year I am thinking of adding more on paper. Thanks for the links to some options!